It’s early. Monday morning. My alarm hasn’t even gone off yet but hubby’s slid out of bed and is putting on his run gear. I’m up and in mine too not minutes later. I glance down at my GPS. Yes, it reads 4.02km. Time to turn around. We run back. Side by side. And hardly say much at all. I love his quiet company these early mornings. Compared to any other training cycle, I know this one will be my favourite one. With the love of my life putting in all this high mileage with me. My early morning training partner. Wednesday night. Speed work. It’s some sort of pyramid. I’m still scared of speed work. Always been so. In my head, I have no speed. It’s the story I tell myself the most often. I’m slow. I work on changing that story – trying to tell myself a different one. After all, I have proof the story I tell myself so often is false. Hard proof. But it’s a tough tune to change. We start the speed. I’m immediately at what feels like my absolute ultimate max. I’m dying. Struggling. But trying to look like I’m fine – it’s all good – no one is dying over here. As I die. I swear I did not go out too hard this time. I stayed mid-pack the whole way. Of course it was because mid-pack was all I could manage. I’m disappointed. I get home and check my paces. Whoa – they were fantastic! Way faster than I actually thought they were. My disappointment goes out the window. Silly me. Thursday night. I’m in White Rock. I’m giving a talk at the Running Room – talking on how to eat to run. I love this stuff. So much. Then I run with them. It’s a learn to run group along with a 5km run group. We run 7 minutes, walk 1 minute, three times over. I love these gals – they are amazing. This reminds me of when I first began running – how I wanted to do something good for myself. Get healthy. Get fit. I finish with two of the ladies who decide to sprint the last 300 metres or so – we dash to the finish and feel the exhilaration of completing another great workout. Saturday morning. Forerunners run clinic. Long run time – got 20k to cover today. And Julie’s here which is fabulous because we’ll chit-chat nonstop and then I hardly even think about the distance my legs are covering. We just fly along and talk food and life. We’re not even half way through when my GPS craps out. I reset it but it craps out again. I hate it when that happens. In fact, it irks me so much I don’t even want to run anymore if the kilometres aren’t being recorded. How will I know far I’ve actually gone? The distance I’ve covered? My pace? Not to worry. 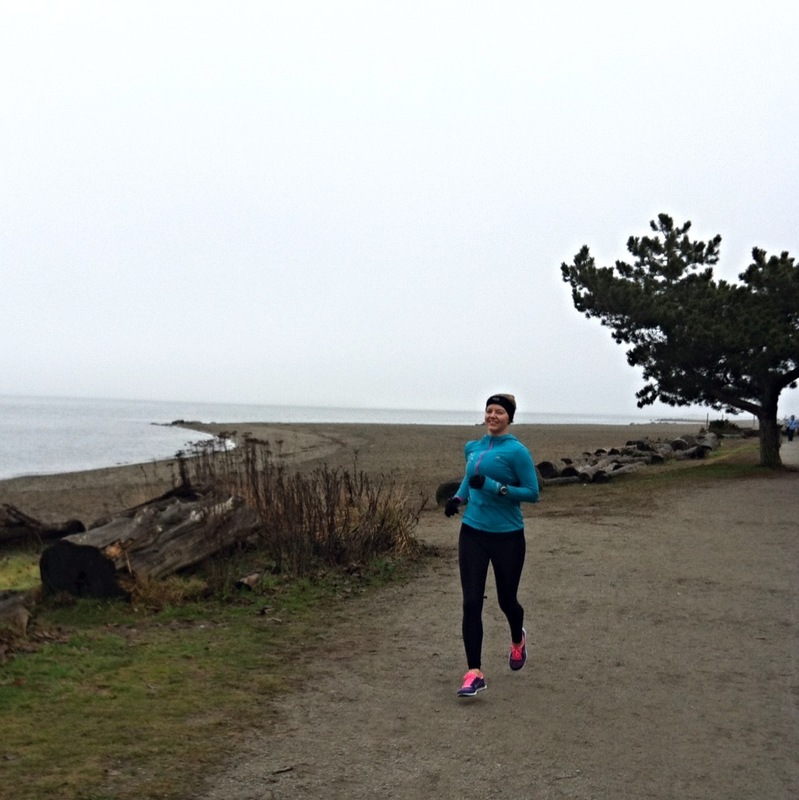 Julie is making sure her GPS is tracking our mileage and pace – she’ll share her stats with me when we’re done. We run stride for stride, chit-chatting and laughing, with her GPS keeping up for the both of us. Sunday morning. Almost not morning anymore (we totally slept in). Crazy foggy. It’s me and hubby again. We feel good. Like, really good. Although stopping mid-run never happens, Sundays are the exception – we stop for a picture. We’ve done this 4 weeks in a row now and we’ll do it each Sunday for the next 26 weeks. A weekly snapshot to help document the journey. Or something like that. Then we turn and run back. We both agree we feel good. Yes we can feel the mileage in our legs, but we also feel ourselves getting stronger. Hubby has more energy than I’ve seen him have in a while. Is it what I’m feeding him? Or all this mileage?!! And I’m feeling crazy optimistic. This is all just… Too much fun. Sounds like you had a lot of great runs!